Be a Life-Long Learner at Any Age! My Mom is absolutely amazing. I've never encountered another human being who has tackled so many different subjects and learned such an array of skills in one lifetime. Whether it be French, bridge, cooking, flying, painting, chess, building a website, poker, Energy 101 or Buddhism (see what I mean! ), she clearly takes the term life-long learner to a completely different level! With the vast influx of new online classes sprouting up, such as those offered by Coursera and Udacity, there's ample opportunity for all of us to learn another skill or pursue a new hobby. 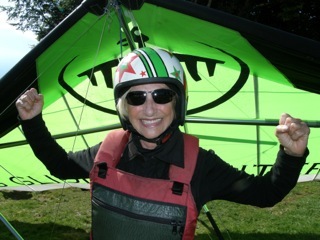 BTW here's a picture of my Mom hang gliding at 70-plus!!!! In fact, according to AARP, most baby boomers report that they feel online classes fit very nicely within their busy schedules and satisfy their desire to learn at their own speed. Instead of raising your hand, you can grab the teacher's attention with a click of the mouse! In addition, very often you will be in the 'ether class' with much younger students and it's a great opportunity to match wits with a different generation. Baby boomers have led the pack in terms of entrepreneurial pursuits over the last decade - if that has always been your dream perhaps it will only take a few online tutorials to take you to the next level. For instance, www.entreprenuer.com offers a great set of blogs and videos for people who want to start a new business. Life experience provides a unique insight into what works and what may not, and being able to spot and forecast trends based on past experience certainly gives boomers a leg up in business! One of the keys to success with online education is to tap into something that you're already passionate about or feel you may have a knack for in terms of picking it up with ease. For instance, the website www.encore.org is a great resource for people who want to start a new cause-related career. Their motto is "leave the world better than you found it." Don't you just LOVE that philosophy! This mindset can drive you to make money and help others, which might empower you to reignite your sense of purpose. Turn your passion into profit! If it's a hobby you strive to capture online there are plenty of resources for that pursuit as well. Learning how to garden, craft furniture or surf is well within reach these days. Perhaps you've always loved music, but never had the chance to learn how to sing or play an instrument. If you want to write, free blogging tools such as Blogger or WordPress allow you to self-publish and build your audience. Oh wait, we can't forget my Mom.. . let's add belly dancing to her 'mastered it' list above! Whether it's to make money, pursue a second (or third!) career or simply for your own personal entertainment, don't let the voices inside your head convince you that you can't try to learn and apply a new skill. Remember, these are your 30 Bonus Years, with bonus being the key word!